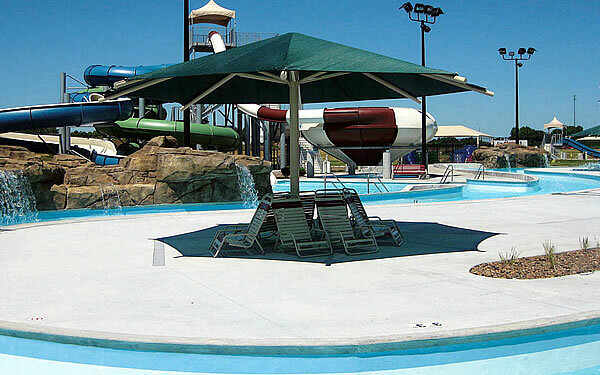 Our company installed this shade at a splash park in Virginia in the summer of 2015. Our Hexagon Umbrella Shades with a hexagon or octagon canopy combine a classic look with stylish appearance. 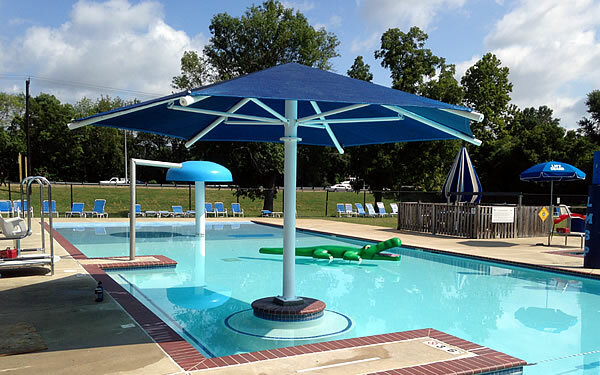 The center-post design allows for larger canopies at greater heights, all the way up to 27′ x 27′. 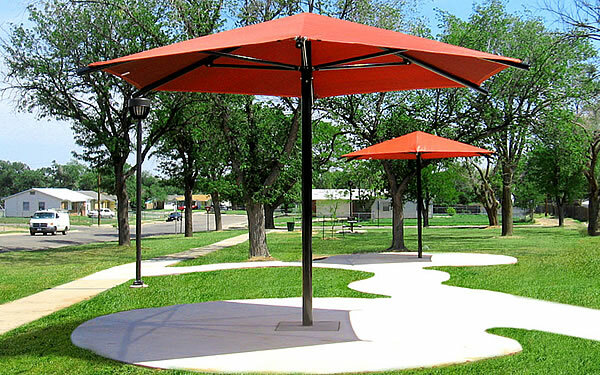 Most importantly, hexagon umbrella shades effectively block out the sun and create much-needed shade. Center-post hexagon or octagon shades are available in the following sizes: 10′ x 10′, 12′ x 12′, 14′ x 14′, 16′ x 16′, 18′ x 18′, 20′ x 20′, 22′ x 22′, 24′ x 24′, 25′ x 25′, and 27′ x 27′. The weight and thickness of the center post will vary based on canopy size required. Our hexagon umbrella shades and octagon umbrella shades come in many colors! 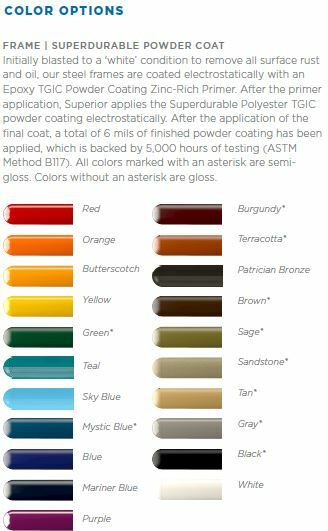 See diagram below for sample colors. Please note that pricing shown below does not include freight or installation. However, it does include a quick-release system that uses “glide elbows” at the top of each corner post (the recommended configuration for seasonal removal of shade fabric). Pricing shown is for structures with vertical posts that secure in the ground with concrete, but a surface-mount option is also available at additional cost (approx. 15% higher). Sizes shown below are standard sizes, but we can custom-make a playground shade to any size. 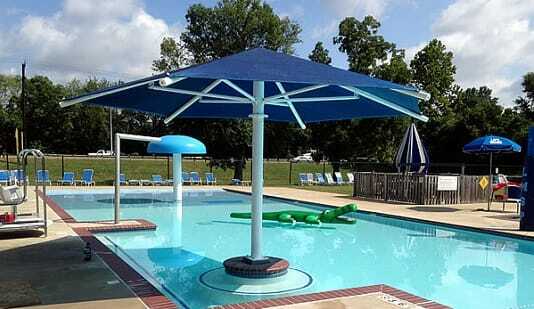 For an official estimate for hexagon umbrella shades, please phone us toll-free or contact us. NOTE: All prices are estimated and do not include shipping or installation. List prices are subject to changes due to commodity cost fluctuations, prices shown are an estimate. It is always safer to phone us. Standard pricing includes vertical posts that secure in the ground with concrete, but a surface-mount option is also available for approx. 15% more. Beyond the sizes shown below, we can design custom structures to your needs. “Umbrella height” is the vertical distance from the ground to the outside edge of the umbrella canopy, not the peak of the umbrella. Note: Two prices are shown for each size of umbrella: one without a quick-release system for the canopy, and one with the quick-release system. We highly recommend the quick-release system, which makes it much easier to remove and replace the canopy (often done on a seasonal basis). ALL SIZES — Please phone us for pricing, at 1-877-840-0707.
phone us toll-free or contact us today!